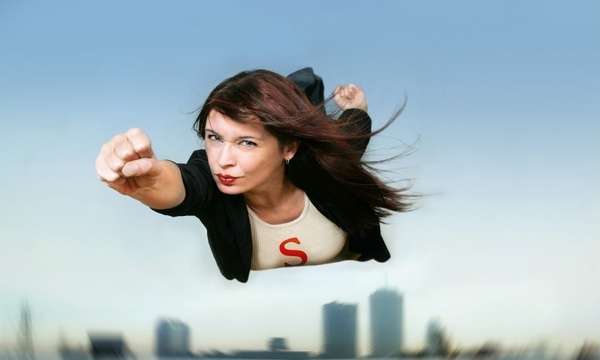 The face of super consumers in the United States is changing, and retailers will need to adopt new strategies to reach them. Multicultural consumers – including black, Asian, Hispanic and mixed-race individuals – will be the dominant force in American retail within decades, and they already make up a disproportionate share of super consumers in some categories. According to the data and measurement giant Nielsen, there are 120 million multicultural Americans, and growth in this population made up 92 percent of the total growth in the U.S. population between 2000 and 2014. Among multicultural consumers, Hispanics are the fastest-growing group, expected to account for over half of all population growth by 2020, as this U.S. Census chart shows. Multicultural consumers have increasing financial resources at their disposal. This group is also significantly younger than non-Hispanic whites, so the median multicultural consumer has many more years of effective buying power ahead of them. That means that appealing to these consumers not only makes sense now, it’s a wise investment for the long term. What Do Multicultural Consumers Care About? Multicultural consumers have unique habits and attitudes that impact their buying habits. Their cultural heritage is an important part of who they are; 78 percent of African-Americans, 71 percent of Hispanics and 61 percent of Asian-Americans agreed with this sentiment in the Nielsen survey, compared to 60 percent of non-Hispanic whites. Multicultural consumers are digitally-savvy; 60 percent of Asian-Americans, 57 percent of Hispanics and 55 percent of African-Americans said going online is one of their favorite things to do in their free time. 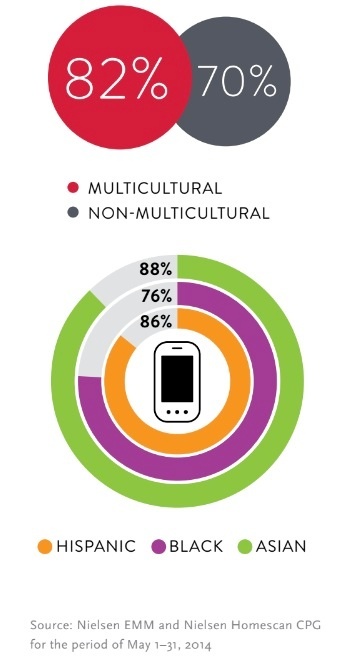 The majority use smartphones to stay connected; 82 percent of multicultural consumers actively use smartphones, compared to 70 percent of their white counterparts. They care about social causes; 43 percent of Hispanics, 39% of African-Americans and 38 percent of Asian Americans expect the brands they buy to support these causes. Asian-Americans are the most likely to buy organic food; nearly 30 percent said they do, compared to 18 percent of Hispanics and whites and 14 percent of African-Americans. What Are Multicultural Consumers Buying? Young and concentrated in large metro areas, multicultural consumers also hold major sway over mainstream tastes and consumer trends. Brands marketing to millennials and younger generations will need to do so with multicultural and intercultural awareness. Not only do multicultural Americans already make up a majority of the population under 9 years old, but Americans of all races are growing up in diverse surroundings – putting sriracha on their Korean tacos, practicing yoga or belly-dancing, watching international football and turning a song with Spanish lyrics into the song of the summer. According to Nielsen, multicultural consumers make up a disproportionate share of the super consumers in 15 major product categories. While they are 38 percent of the population, they are 67 percent of the super consumers for dried grains and vegetables, 53 percent for hot sauce and 53 percent for family planning, for example. 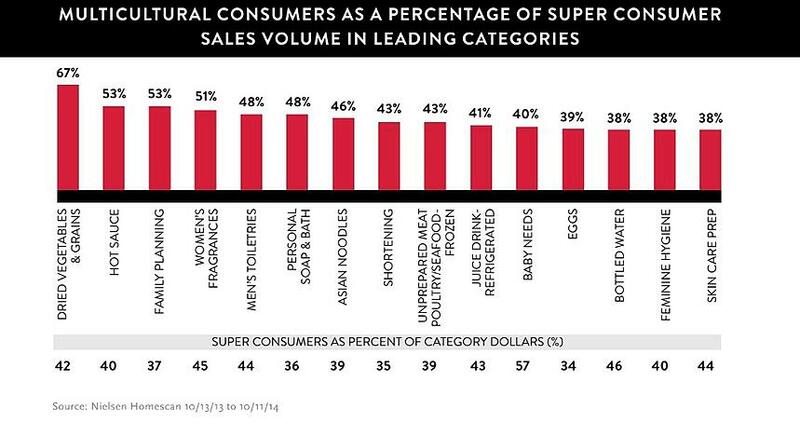 There are some broad trends in the categories where multicultural consumers are over-indexed among super consumers. Many of the categories are related to personal care and grooming. Others, like family planning and baby needs, seem connected to the fact that a disproportionate share of multicultural households are young families. Multicultural super consumers also are over-indexed in categories of products that go into making the foods so central to their cultural identities: dried vegetables and grains, hot sauce, Asian noodles, shortening, frozen poultry and seafood, and refrigerated juices (again, with young multicultural families, this could be bolstered by children’s taste for juice). How Can Retailers Reach Multicultural Consumers? Most multicultural Americans don’t exist in a single cultural environment. They want to take their place in the American mainstream while also maintaining their cultural heritage. To reach these consumers, retail brands will have to understand their demographic profile and needs, seek new advertising platforms such as social media, and speak the consumers’ language. This last point is figurative – highlighting how a product fits into a consumer’s identity and values – but also literal. Even American-born consumers and those proficient in English are often more comfortable shopping in their native language or are more attracted to advertising in their own language. In order to find not just the right words, but also the cultural insights to reach multicultural consumers in a meaningful way, retailers who want to gain a competitive advantage are relying more on language services. Having phone interpreting available in a wide variety of languages within their call centers is just the beginning. Retailers are also using video remote interpreting and on-site interpreters to create memorable in-store experiences for customers. For instance, some home improvement stores are offering workshops to show multicultural consumers how to use their products. Other retailers are using video remote interpreting to offer more of a self-service approach. For instance, Target created a model smart home in San Francisco to show customers how to integrate the “internet of things” (IoT) into their homes. Learn more about how retailers can use language services to reach multicultural consumers.